Veteran actress speech in Telugu got overwhelming response from crowd. 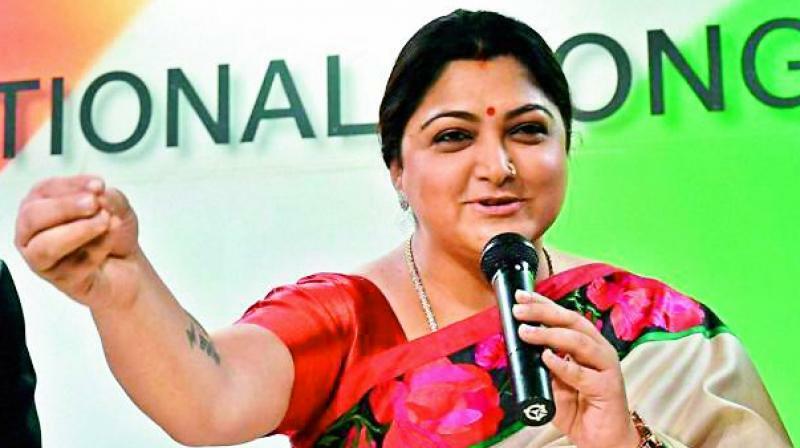 Adilabad: Veteran actress Kushboo on Tuesday said people would get ‘Bhagmati Biryani’ instead of Hyderabadi Biryani, if they voted for the BJP and its poll partner TRS in the upcoming Assembly polls since the BJP wanted to change the name of Hyderabad city. Kushboo was addressing a gathering as part of the Congress party’s roadshow in Adilabad town in support of party candidate Gandrath Sujatha contesting from Adilabad. Recently, BJP leader Raja Singh said the BJP would rename Hyderabad city as Bhagyanagar if they came to power in the state and would respect the sentiments of the Hindus. Responding to the crowd who asked her to speak about 12 per cent reservations promised to the minority by TRS, she said people would not get 12 percent reservations instead they would get Biryani that too ‘Bhagmati Biryani’. She said TRS was now offering Biryani instead of 12 per cent reservations to the minorities. Hyderabadi Biryani is famous for its delicious taste all over the world. Many famous people often wished to eat Hyderabadi Biryani whenever they visited Hyderabad. Kushboo said TRS had become old and there was no demand for it like Ambassador cars whose manufacturing company had shut down. Kushboo’s speech in Telugu got overwhelming response from the crowd during the road show. She said TRS and BJP were not separate and asked the crowd to believe that they were one. She alleged that PM Na-rendra Modi’s government had amassed huge wealth from the public through GST, demonetisation and other taxes and among that it was spending Rs 4,500 crore on party publicity.